60% of youngsters between 12 years to 24 years of age get affected by acne the condition causes whiteheads,blackheads, pimples and other things like rashes on the face ,chest ,shoulders and back.the affected area of the skin gets red and itchy rashes.it nevertheless causes a great deal of embarrassment depression and lack of confidence but what causes acne? when our body is unable to remove toxins through excretion.our bloodstream becomes contaminated,giving rise to acne.this could happen due to constipation, irregular bowel movements.irregular meal timings and the consumption of food rich in starch, sugar, oil and fat. 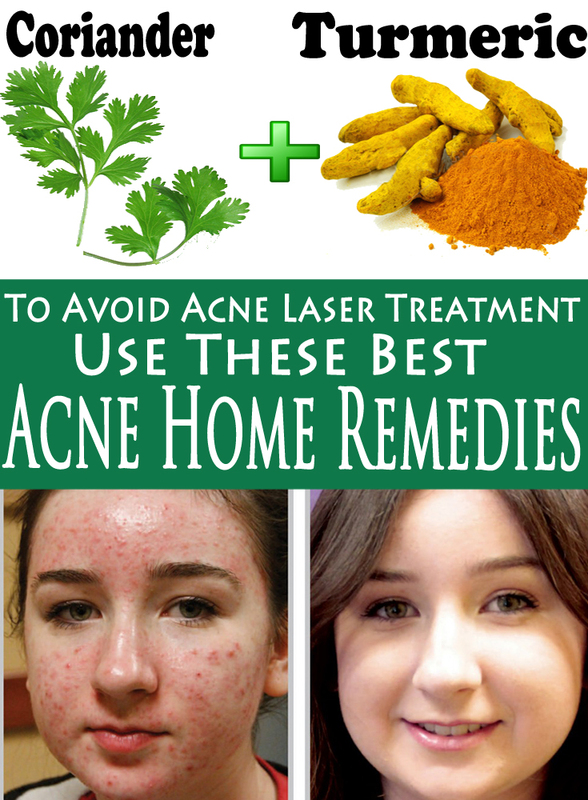 But hey don’t worry acne is easily curable.home remedies can help purify blood clear the skin here are a few simple once. Best Natural Acne Treatment only for you.so lets get started. 1.Remedy Using Coriander leaves & Turmeric Powder. 1.Take a handful of fresh coriander leaves and crush it into a paste. 2.Place it on a sieve.extract it juice. 3.Now Add a pinch of a turmeric powder. Wash your face first then apply this mixture on your face every night before going to bed. Garlic contains allicin , a natural antibiotic that purifies blood and helps stop the development of acne. 1.consume about 2-3 garlic cloves everyday for a month. 2.You can also apply the garlic paste directly on the affected area. 3.people having a sensitive skin may add a teaspoon of yogurt to the garlic paste. 2.take a lemon juice in a bowl. dip the cotton pad in a juice and apply it on the affected area.leave it overnight and then next morning wash it off with cold water.repeat this once in a week. 1.take a little amount of toothpaste and apply it on the affected area. 2.leave it for about 15-20 minutes. 3.then wash it off with cold water. 1.take a bowl of a hot water. 2.place your face over the bowl allowing the steam to get in touch with your face. 3.do this for about 10 minutes.then wash of with cold water. Steaming cleanses your pores removing all the excess diet and clearing your skin.you can even use a steamer if you want to. 1.take 1 teaspoon of honey. 2.add a dash of cinnamon powder. apply this paste on the affected area and leave it for about 15-20 minutes. cinnamon and honey helps in killing the bacteria hence reducing your acne. 1.take a cup of cooked oatmeal. 2.add 1 teaspoon of honey in it. 3.now add the juice of half a lemon. rub your skin with this and leave it on for 30 minutes.then rinse with lukewarm water. 1.take equal proportions of fuller’s earth. apply this mud pack on your face and wash it after it dries out. 1.wash the affected area 2 times a day with mild cleanser and warm water. 2.while cleaning gently massage your skin and do not scrub. 3.do not pop or squeeze your acne in fact, do not even touch your face every now and then as it may spread dirt ,grime and bacteria. 4.now last but not the least drink plenty of water to flush out toxins.eat fresh fruits and vegetables instead of non nutritious junk food. Ok,so now the acne have vanished but do not blush.if you do not take precautions they might appear.choice is your anyways. TAKE CARE !